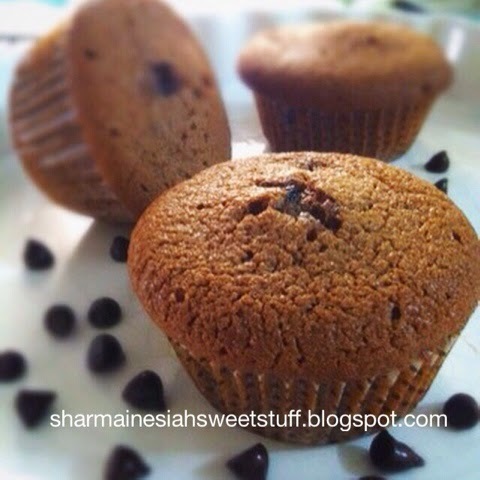 A chocolatey delight that is yummy & easy to make. 2. Fill a regular 6 holes cupcake tin with paper cases. 5. Sieve the flour and the cocoa powder into the mixture in the bowl. 7. 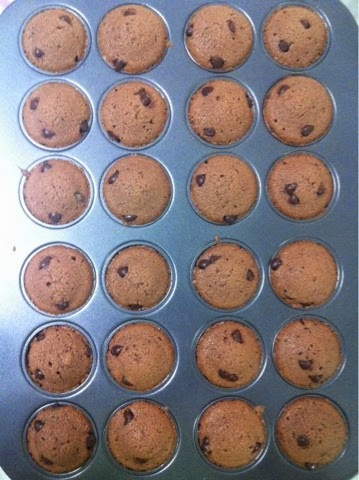 Gently fold in the chocolate chips until corporated. 8. Drop a big spoonful of the mixture into each of the 6 cases. 9. Cook in the oven for 15-20 minutes or until it looks golden. Tips: Drop a few chocolate chips on top of the batter in the cases to make em look more tempting & more "double-chocolate" like. I made this using the 24 holes mini cupcake tin too!